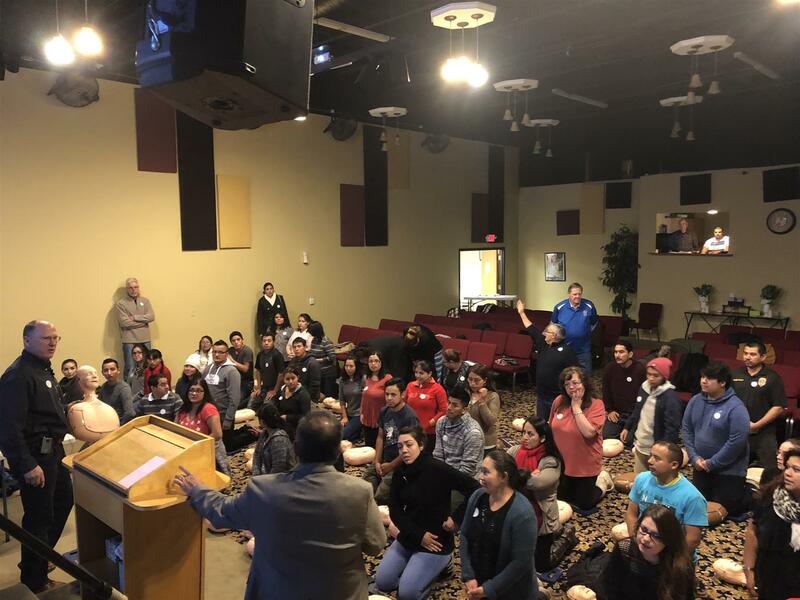 The December 2018 service project at IOCP was a success! 2018 Fundraiser: And the winner is... ! This year's fundraiser is over! Watch this site more details on money raised. But I know what you really want to know..
Free CPR and AED training courses are available to the Plymouth community this fall, thanks to a partnership between the Plymouth Public Safety Department and Rotary Club of Plymouth. The one-hour Heart Safe Plymouth training sessions are open to teenagers and adults who are interested in learning to help save lives. 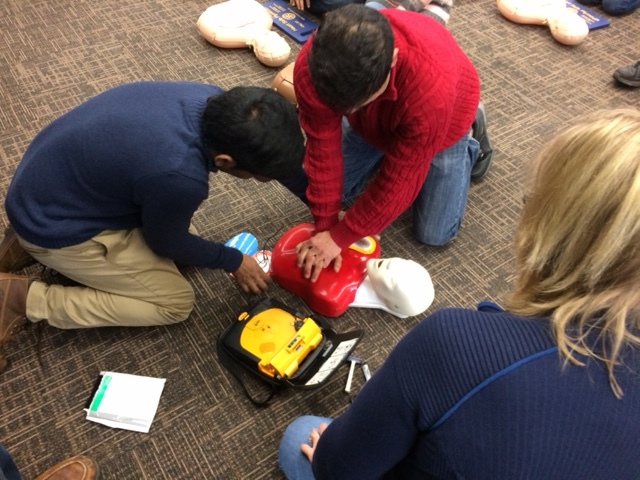 Participants learn hands-only CPR, which teaches chest compressions without mouth-to-mouth breaths, as well as the use of an Automated External Defibrillator (AED). AED devices detect disturbances in the rhythm of a heartbeat and are able to treat them through defibrillation, allowing the heart to re-establish an effective rhythm. 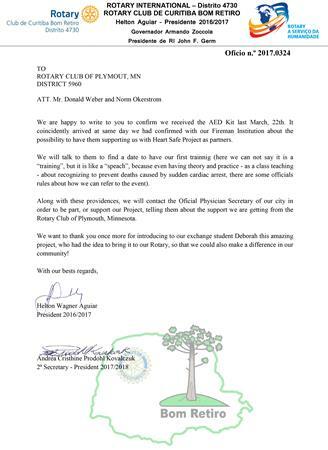 With the goal on planting 1.2 million trees between July 1st, 2017-June 30th, 2018 for Rotary as a global organization, the Rotary Club of Plymouth rose to the challenge and planted 39 trees reflecting a tree for our membership. However, this could not be done alone, we enlisted the amazing partner in the City of Plymouth. Not only did the City collaborate in the design and funding, the City Forester researched the proper trees for a area the city located, provided an education on how to plant trees so they thrive and survive after 20 years without roots choking out, and then created educational plaques describing each tree and its value so those walking along the path of the tress could learn about the trees and come to better understand the intelligence of the Plant Kingdom and Mother Earth. 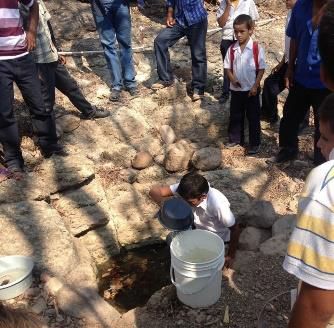 The gift of this movement came from one person, the Rotary International President Ian Reisling. He directed over 1 million people to focus our attention back onto the environment in a way that we could give back easily and effectively to support the planet which supports a species of life each day! These trees not only add beauty to the area they are planted in, but they provide homes for other lifeforms, stabilize the soil, and the root systems clear impurities out of water and restore clean healthy water in lakes, rivers, and all life. This is a perfect example that when we come together, we evolve together, and Ian and 1.2+ million Rotarians did just that this year! Thanks to all those who serve everyday in infinite ways on a planet who are waking up to the collective truth, we are not separate from each other, including the earth and her kingdoms. The time to recognize and respond to our oneness is now. This is the change we seek! I send gratitude to all who respond to the hearts call to offer some love anywhere it is needed! In Rotary we are grateful for the annual donations that members contribute, especially those who have made a lifetime out of giving to Rotary so the projects and service done can reach all life, throughout the planet! Two members here are being recognized for their amazing generous hearts! Anybody interested in being trained in Bystander CPR and AED use is encouraged to attend. 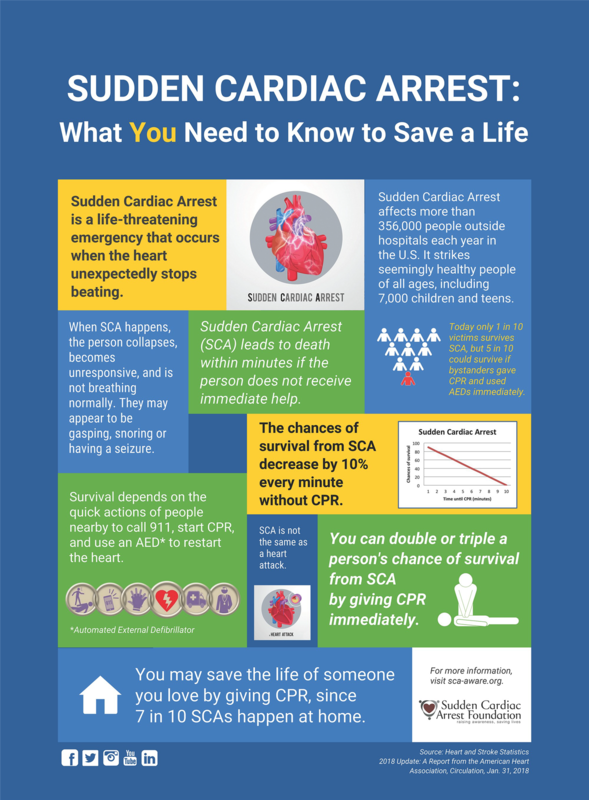 Learn how to save the life of a Sudden Cardiac Arrest (SCA) victim. The one-hour training sessions are open to teenagers and adults who are interested in learning to help save lives. 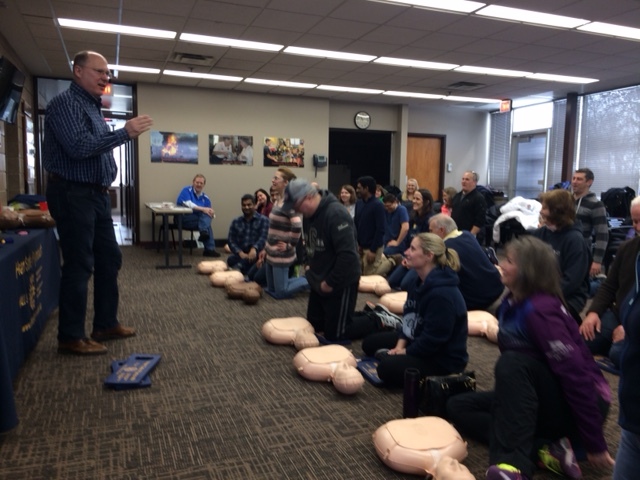 Participants can learn hands-only CPR, which teaches chest compressions without mouth-to-mouth breaths, as well as the use of an AED. An AED, or Automated External Defibrillator, is a portable electronic device that automatically detects disturbances in the rhythm of a heartbeat and is able to treat them through defibrillation, the application of electrical therapy, allowing the heart to reestablish an effective rhythm. If you are called on to give CPR and AED in an emergency, you will most likely be trying to save the life of someone you love: a child, a spouse, a parent or a friend. 70 percent of out-of-hospital cardiac arrests happen in homes. Unfortunately, only about 46% of people who experience an out-of-hospital cardiac arrest get the immediate help that they need before professional help arrives. The City of Plymouth was designated a Heart Safe Community in 2013 by the American Heart Association. The program recognizes efforts by individual communities to improve their system for preventing deaths caused by sudden cardiac arrest. Rotary Club of Plymouth began holding free CPR and AED training sessions in 2012 and has helped train more than 5,000 Plymouth residents and businesspeople. Sponsors include Heart Safe communities through AHA, Minnesota Department of Health and Allina Health. Businesses groups and organizations can obtain more information or schedule a free training. For more information, email heartsafeplymouth@gmail.com, call CPR/AED Instructor Norm Okerstrom at 763-238-8443 or visit rotaryplymouth.org. Plymouth Public Safety Building. To register, visit heartsafeplymouth.eventbrite.com. Space is limited to 30 participants per training session. Plymouth Dunkirk Fire Station III. To register, visit heartsafeplymouthfire.eventbrite.com. Space is limited to 50 participants per training session. Peter Bartling bartlingpeter@yahoo.com will send descriptions of our event for news articles. 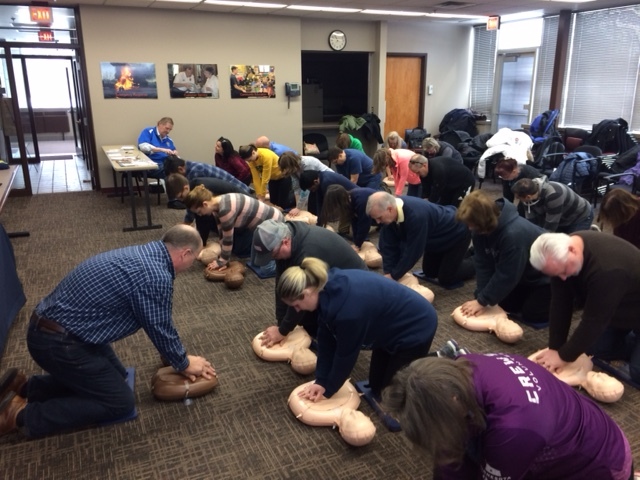 Plymouth, Minn. – Due to continued popularity, additional Heart Safe Plymouth training sessions have been announced. 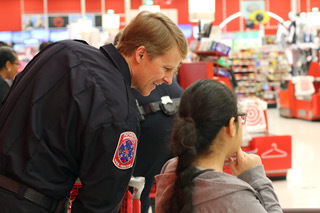 A partnership between the City of Plymouth Public Safety Department and Rotary Club of Plymouth, the free trainings teach bystander CPR and AED use to the public. The following training sessions are set for 7-8 p.m. Wednesdays on the second floor of the Plymouth Public Safety Building, 3400 Plymouth Blvd., adjacent to City Hall. To register, visit heartsafeplymouth.eventbrite.com. Space is limited to 30 participants per training session. The following training sessions are set for 10-11 a.m. Saturdays at Plymouth Fire Station III, 3300 Dunkirk Lane. To register, visit heartsafeplymouthfire.eventbrite.com. Space is limited to 50 participants per training session. Registration is required. Due to the popularity of the training sessions and limited space, early registration is encouraged. An AED, or Automated External Defibrillator, is a portable electronic device that automatically detects disturbances in the rhythm of a heartbeat and is able to treat them through defibrillation, the application of electrical therapy, allowing the heart to re-establish an effective rhythm. 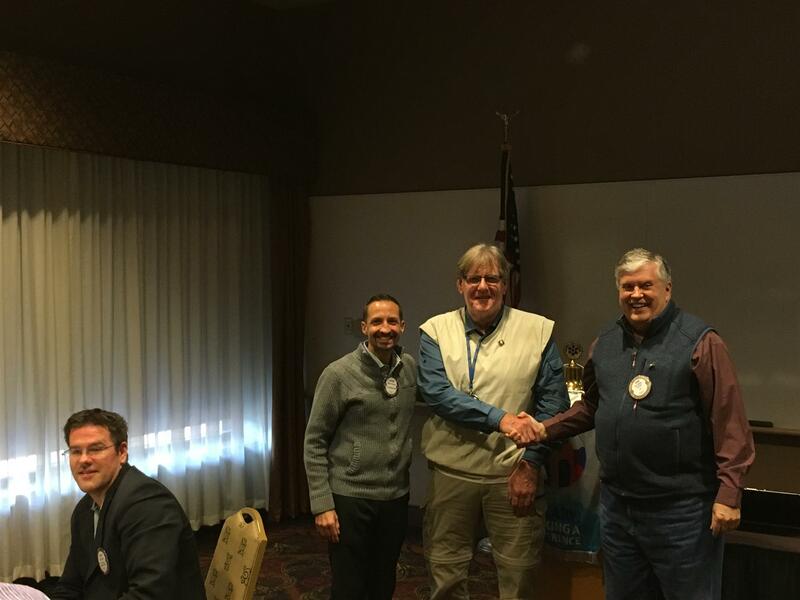 Rotary Club of Plymouth began holding free CPR and AED training sessions in 2012 and has helped train more than 5,110 Plymouth residents and businesspeople. 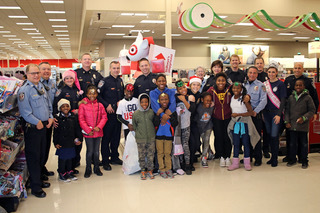 Sponsors include Heart Safe communities through AHA, Minnesota Department of Health and Allina Health. 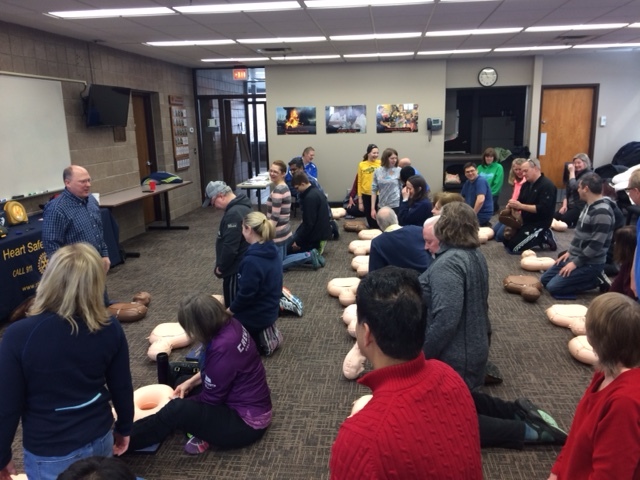 Cutline: Since 2012, more than 5,110 Plymouth residents and businesspeople have been trained in bystander CPR and AED use through Heart Safe Plymouth, a partnership between the City of Plymouth Public Safety Department and Rotary Club of Plymouth. 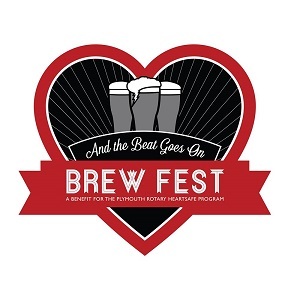 THANK YOU TO OUR COMMUNITY, SPONSORS, BREWERS, DISTILLERS, AND ROTARIANS FOR THE SUCCESSFUL EVENT LAST SATURDAY WE ARE TRULY GRATEFUL AS WE CONTINUE OUR GOAL TO TRAIN 7,000 (4,622 to date) PEOPLE ON RECOGNIZING THE SIGNS OF SUDDEN CARDIAC ARREST AND HOW TO RESPOND IN THE MOMENT TO SAVE LIVES! 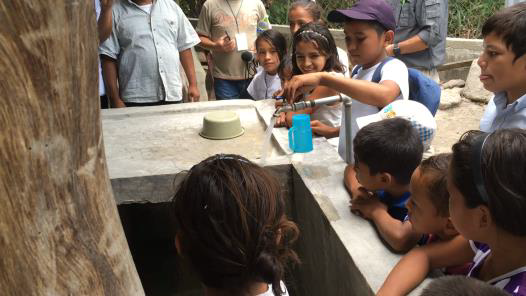 Learn how you can make a difference and support Rotary's WAter, Sanitation, and Hygiene project in Honduras! The Rotary Club of Plymouth continues to close our GAP to 5,000 (4,443 today) trained by June 30th, 2018. Our ultimate goal is 7,000. The following is a picture from a recent training. If you know of anyone who is interested in being trained please see our upcoming free sessions at https://www.eventbrite.com/e/heart-safe-plymouth-plymouth-rotary-club-tickets-27155834833 We also will come into a local Plymouth business/community event/sporting event at no charge and train the entire group! Rotary Club of Plymouth began holding free CPR and AED training sessions in 2012 and has helped train more than 4,300 Plymouth residents and businesspeople. Sponsors include Heart Safe communities through AHA, Minnesota Department of Health and Allina Health. 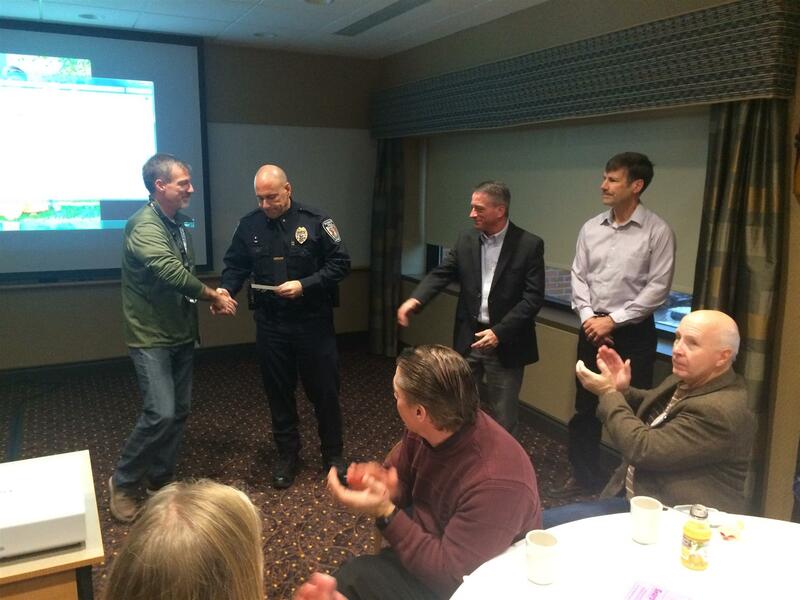 Cutline: Since 2012, more than 4,300 Plymouth residents and businesspeople have been trained in bystander CPR and AED use through Heart Safe Plymouth, a partnership between the City of Plymouth Public Safety Department and Rotary Club of Plymouth. 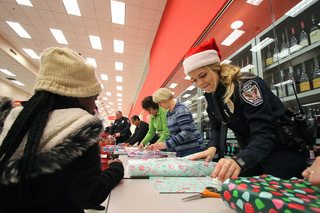 This past Saturday was another amazing event between the City of Plymouth Police department and the Rotary Club of Plymouth as we were able to come together and provide some wonderful children an opportunity to go Christmas shopping with some officers of our community! Thanks for all those who helped make this a special event!